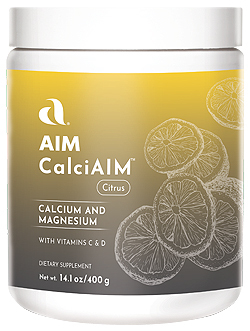 CALCIAIM - Awesome nutritional support for strong, healthy bones. This healthy bone formulation contains beta carotene (vitamin A), ascorbic acid (vitamin C), calcium lactate, calcium gluconate, calcium carbonate, ergocalciferol (vitamin D), magnesium citrate, magnesium carbonate, zinc lactate, zinc gluconate, copper gluconate. The juice blend in CalciAIM is composed of mandarin and Valencia orange, carrot, Tahitian lime, and lemon juices. This juice blend contributes natural calcium from these calcium-rich fruits. Each scoop contains 17 percent juice. In additional to the many beneficial naturally occuring nutrients in these juices they play a key role in assuring the most effective method of nutrient delivery, and in helping you achieve superior whole-body health. Other beneficial ingredients include citric acid, maltodextrin, chicory root extract, xylitol, natural fruit flavors, malic acid, L-lysine HCL, xanthum gum, stevia leaf extract, silicon dioxide. Concerned about the condition of your bones? Try this product faithfully for 4 months and let us know your results.